T3 Bayside, a timber office building in Toronto, aims to be the tallest in North America. 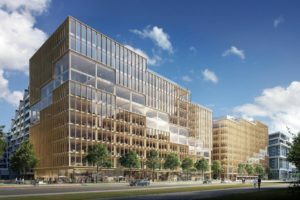 T3 Bayside, one of the tallest timber office buildings in North America, will be emerging in Toronto’s Bayside community, located on the shores of Lake Ontario. Designed by 3XN, the 10-storey structure will be 42 m (138 ft) tall. The office space is part of an 809-ha (2000-acre) revitalization initiative aiming to transform Toronto’s waterfront. The new building and adjoining plaza will serve as a dynamic visual and pedestrian gateway to the entire neighbourhood, connecting residents and visitors to the waterfront. Equal parts urban market, social space, and landscape, the new plaza aspires to be the public heart of the project. The use of timber contributes to the sustainability of the building, both reducing construction time and allowing the building’s elements to be easily disassembled and re-used for other purposes. The wooden structure will be built in cross-laminated timber (CLT). The materiality of timber defines the interior esthetics and will also be reflected in the exterior of the building. Both the material and the shape of the wooden frame is expected to provide effective acoustical control. Diagonal cuts in the building volume break the massing down to a more human scale around the plaza, and build back up to city scale as they rise across the façade.